1) It confirmed the things I was doing right, but felt like I was the only one doing them. 2) It told me to stop doing things that weren't working, but I kept trying anyway. I suppose I did this because I felt like everyone else was doing them, so why shouldn't I? 3) It gave me important insight into consulting as a business. It taught me how to market, how to arrive at good pricing, and how to network more efficiently. In this job market that many of you are looking for new positions. 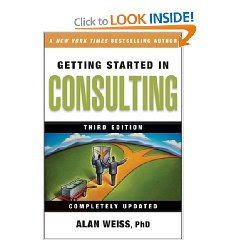 If you are considering a consulting practice, this book will be an excellent beginning.